Appreciative Inquiry is a change process developed by David Cooperrider towards the end of the last century. Generally included in the broad category of ‘Positive Psychology’ it’s an approach likely to appeal to women for three reasons. It’s conversation based – playing to women’s interpersonal skills. It recognises our human tendency to make meaning through dialogue: the “social construction of reality”. And it’s inclusive: extending the conversation to as many people as possible. The questions asked are the “tools for change”. Not just any questions but well constructed ones that sow the potential for change by directing our attention. For women in the workplace it offers a way to take the lead without being judged as controlling. The focus is on building the future – the new and emergent – not on fixing the old. It’s a perspective likely to resonate with parents. When we bring up our children our focus is generally on future potential. Cooperrider has outlined five key principles of Appreciative Inquiry which we can put to use in fostering change towards a more balanced working culture. Organisations are living human constructions not mechanical systems that exist independently of the people within them. In many cases they are literally man-made with cultures established in the last century to support male ways of working. What this means is that we can reconstruct our organisations to better meet changing social expectations. Our mothers and grandmothers started this process when they asked for arrangements such as part-time, term-time and job-share. It’s down to us to continue the process by re-shaping work at more senior levels so that organisations become more truly inclusive for women. Inquiry is intervention. When we ask the right questions and ensure the right focus we begin the process of change. So rather than believing flexible working is impossible at senior levels we ask “where and when have we seen someone in a senior role successfully work flexibly – in this organisation or this industry?” One of the most powerful questions I ask when beginning a consulting assignment is “who in this organisation has experience of flexible working arrangements at senior levels?” It’s always surprising to learn how much knowledge already exists under the radar. And these people become the organisation’s ‘database of experts’ – a key resource able to provide insights into how specific arrangements can succeed. Human organisations are more like open books – constantly being re-written – than closed systems. So Appreciative Inquiry uses storytelling to identify our ‘cultural artefacts’. What do our current role models for success look like? What behaviour is rewarded? What stories do we tell ourselves about the organisation and its culture? We then begin to re-write these stories looking for new heroes and new achievements. Rather than talking about the manager who works long hours and drives her people hard we begin to talk about the one who manages to work a flexible arrangement successfully and the many benefits this has brought to her staff and clients. Our collective imagination is an infinite resource for changing organisations. Rather than tying up our energy in analysing what’s going wrong we ask ourselves how it will look when things go well. The “miracle question” I talk about in this post is a great place to start. The momentum for change is more effective when positive energy is harnessed. We know this is true. When we become excited about the potential benefits gained by achieving a positive goal we’re likely to put more energy into the process. A short blog post like this cannot do justice to a complex process like Appreciative Inquiry. But – in the spirit of the process – it can begin to draw attention to what’s important and to ask the right question. So: where are you focusing your energy – in overcoming objections to flexible working or in creating a shared vision of how it could work for everyone? We spend so much time reading and talking about work life balance and yet most of us conclude our life is not in balance. Why is that? 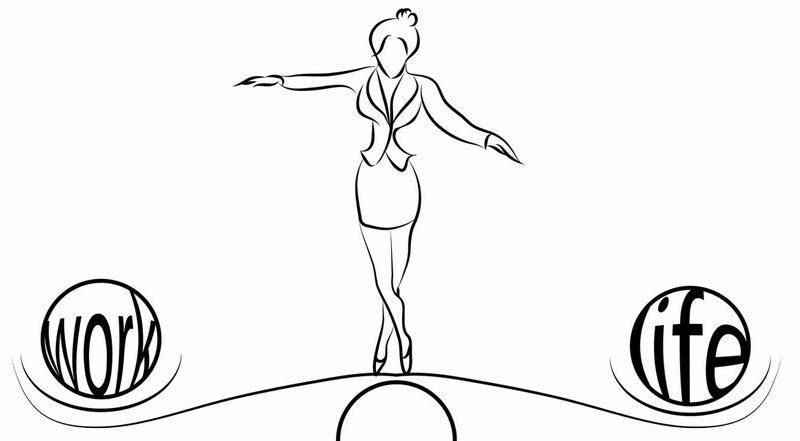 Put simply: most of us don’t know what good balance means to us. And if we don’t know where we’re going how will we know when we get there? At a conference a few years back a higly qualified coach – on hearing I was a member of the British Psychological Society’s working group on Work-Life Balance – asked “So what’s the formula for balance?” I shared with him – and now share with you – the conclusion I’ve gathered from trawling the research evidence. “Work-Life Balance is the individual perception that work and non-work activities are compatible and promote growth in accordance with an individual’s current life priorities”. Set aside some time when you won’t be disturbed. At least ten minutes – you can always return to this exercise later – but up to half an hour if possible. Imagine you went to sleep this evening and overnight a “miracle happened”. When you wake in the morning you have your ideal work-life balance. How would you know? What would tell you? How would you feel? What would you be thinking? What would you be doing? What would you be seeing? Hearing? What else would tell you this “miracle” has happened? Write down your answers as fully as you can. The idea is that rather than trying to find the solution from inside the problem, we look at it from a place where it’s been solved and then identify how to get there. It’s loosely based on the famous quote by Albert Einstein “we cannot solve our problems with the same thinking that we used when we created them”. With this approach you gain a clearer idea of what would work for you – what you need at this time. And with that clearer roadmap you’re more likely to get there!